Solaire grills come in many different sizes, but the most popular version is the Solaire Anywhere Portable Infrared Grill. This is the leading portable infrared grill. The Solaire Anywhere Portable Infrared Grill a full powered infrared grill in a small and sturdy package. The thing that sets its apart from other portable gas grills is what it has under the hood - two infrared burners that put out twice as much heat as a conventional gas grill. One of the big benefits of an infrared grill is a quick heat-up time, and the Solaire grill certainly delivers. It goes from cold to ready to cook in 3 to 5 minutes! Cooking a steak only takes about 5 minutes. When you are done, it cools down in maybe 5 minutes. So in 30 minutes, you can go to from a cold grill, to cooking your food, to being ready to pack it up... that's fast! Cleanup is also easy - like most infrared grills, the Solaire grill can just be left to run for a few minutes after cooking is complete to burn off any remaining residue. The burners and grate both easily lift out. Cooking on the Solaire grill requires some care, due to the high output and somewhat limited adjustability of the burners. It works great for those that want to sear their steaks with a medium rare inside. However, the lack of adjustability on the low end means you have to keep a very close eye on what you are cooking. Foods that require "low and slow" cooking, like ribs and whole chiken breasts, are extremely difficult to cook well. 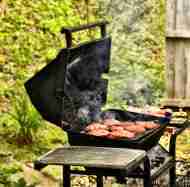 Be careful about cooking in a breeze... some users report problems keeping the grill lit in windy conditions. Most people that are looking at the Solaire grill are looking for a portable package, and the Solaire delivers. The complete grill weighs about 20 pounds and measures 21"W x 12"H x 13"D, including the carrying handles. It has carrying handles, latches to hold the lid closed in transit, and works with 1 pound portable propane cylinders (or normal 20 pound propane tanks with an adapter, not included with the grill). It's perfect for tailgating, on the boat, camping, or with the RV. It comes standard in 304 stainless steel, with an option of upgrading to 216 stainless steel for use in high corrosion environments, like on a boat. Build quality is high. OK, so what a Solaire grill cost? The Solaire Anywhere! Infrared Grill 304 Stainless Steel Grill model will run around $325. To upgrade to the Solaire Anywhere! Infrared Grill Marine Grade 316 Stainless Steel Grill, you are looking at around $500. Certainly not cheap... but if you want a lot of grilling power in a small, durable, and convenient package, the Solaire infrared grill is definitely worth your consideration.